I’m heading out of town again. Just for a few days for the long weekend, heading out to Bowen Island to chill alone and study, relax, and do a lot of rowing in the bay. I may take photos and, if so, more likely than not I’ll post a few on here when I get the time. Here’s a way old pic of me and one of my baby sister’s friends in the rowboat three years ago. 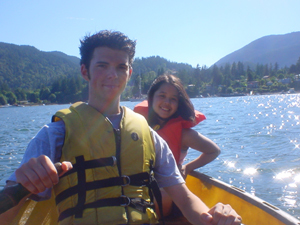 This entry was posted in Canada, North America and tagged Bowen Island, Ferry. hope you’re having a bomb!